While science doesn't have a time machine to retroactively address your lack of adequate preparedness for the holiday season, we can still help you with that dawning realization that you still aren't ready for Christmas Eve and the last night of Chanukah. Requires: cookie dough and an oven. Bake up a batch of dinosaur cookies to ground your holiday desserts in delicious science. You'll need to buy or build dinosaur cookie cutters, or hate yourself a tiny bit by hand-cutting around templates instead. If you're feeling really creative, you can try hand-modelling trace fossils instead to add a bit of mystery to your baking. Variations: Dislike cookies? While you're probably too busy to decorate an epic geocake, you can still make a layered planetary cake with the assistance of this video tutorial and bit of food colouring. Requires: these images and access to a printer. The Chandra X-Ray Observatory is a reliable source of incredible images, constantly peeking in on supernova, layering in black holes in gorgeous galaxies, and making nebula that much more wispily intriguing. It's one of my go-to telescopes when I'm having a rough day and need a moment to bask in the endless beauty of our universe to reset my perspective. Capture that feeling of awe year-round with a 2015 calendar and keep appointments and deadlines in perspective with a bit of epic star-death and galaxy dynamics! Variations: Download a more kid-friendly all-NASA calendar at the Space Place for a calendar loaded with factoids in a distinctly wiggly-line aesthetic (scroll down for 2015), or build your own calendar from scratch using contributions from the Hubble Space Telescope, the infrared Spitzer Space Telescope, or dive through our near-endless highlights of beautiful images to create your own theme. Requires: researching local science centers. While the latest Night At The Museum was disappointing, the reality of getting backstage at an aquarium or doing a sleepover in a museum is a total blast. You'll need to target this to the age of your gift-recipient: typically the after-hours events are adults-only with a well-stocked bar while the sleepovers are strictly for students and with adults only allowed to tag along as a designated guardian. This gift requires benefits local-knowledge, so drop a note if you've had any great experiences! Variations: Skip the special event and pick up a membership to a local science center, museum, or planetarium instead. Not only will you be giving the gift of entertainment and education, you'll be supporting notoriously-underfunded local science outreach programs. Requires: this PDF and access to a printer. We're in love with Orion, NASA's prototype spacecraft for human deep space exploration. This year the spaceship took its first test flight, the only uncrewed flight before astronauts are on-board. Make your gift a tribute to the historic moment and relive the excitement with this paper model. You can fiddle around with scissors and glue to assemble it yourself, or give it as flat paper to give the gift of Some Assembly Required. Variation: Not into fiddly papercraft? Print out the ABC's of Rocketry as a colouring book for an educational alternative. It's a storytelling trope to give a loved one the moon, so why not make it a reality? Except the moon is a bit predictable, so go for a favourite spacecraft, asteroid, or particularly noteworthy crater instead. You can even be the ultimate in trendy by printing out the first tool ever made by the International Space Station's new printer, the famously-emailed ratchet wrench (which you can pair with a link to this video of the wrench-in-action). Want something more extravagant? Thanks to Science Hack Day, you can print the entire universe. It's surprisingly spiky. Variations: Print the object of your choosing out of a more exotic material, or make it edible with a food printer to stick with the theme of holiday indulgence. No access to a printer? Grab some modelling clay and do your best at a clumsy hand-imitation. Requires: donating to this Kickstarter. That Other Shirt is becoming a reality with this Kickstarter campaign. While this seems like a futile item to add to the last-minute list since it can't possibly arrive in time, but that's not because you procrastinated in your shopping: the shirts aren't shipping until March. So, back the project, get a shirt, deliver an IOU, and smugly blame the delay on the project, not your lack of planning. Not only is this shirt a tribute to notable women in science, technology, engineering, and mathematics, but the shirt's creator Elly Zupko founded a nonprofit to wiggle around the no-charities-on-Kickstarter rules so she can funnel the proceeds into more outreach projects. Variations: Pick up another science-friendly shirt, but then you can't blame the delay on Kickstarter. You can also skip the shirt and go directly to supporting science-friendly charities. Zero time and zero money? You can still bring science into your celebration by browsing this collection of space-themed holiday cards from the European Space Agency [warning: music-autoplay]. Variations: Want something more dynamic? United Launch Alliance put together an animated Rube Goldberg machine celebrating their successful launches for the year as a video greeting card. 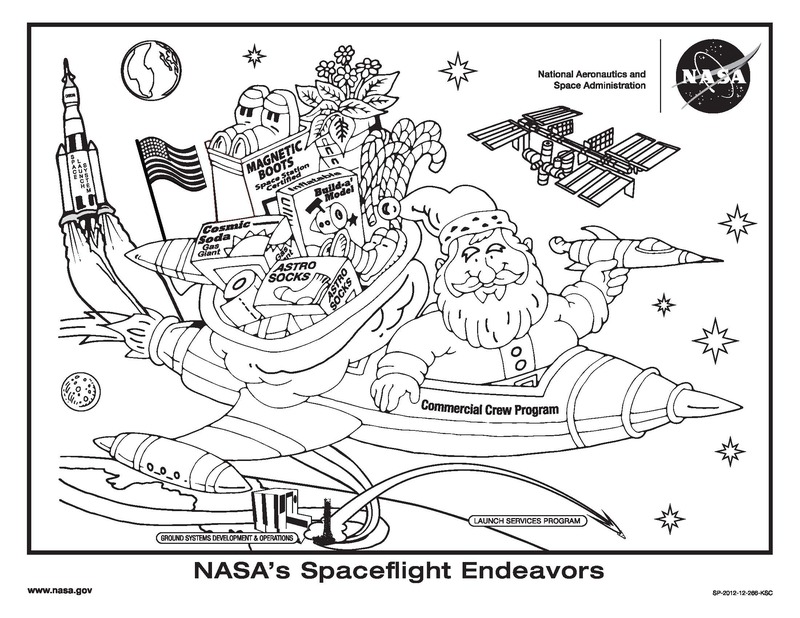 Or you can print out this rocketry Santa from NASA for a colouring book activity card. Requires: image of a scientist, paper, scissors. Symmetry Magazine got this party started with stencils to snip out paper Einstein, Curie, or Schrödinger snowflakes, but why stop there? Pick your favourite scientist, artistically simplify a photo until it matches your skill level for intricate snipping, and go to town with a pair of scissors. Pair with a card explaining who they were, what they did, and why they're a science hero worth learning about to round out the package. Variation: Need to make it a bit classier? Mount the snowflake in a frame for display, stick it to a piece of paper in a contrasting colour, or cut it out of a fancy piece of paper. Need to up the geek-quotient? Cut it out of a related science article, magazine, or scratch notes with plenty of aesthetically-pleasing equations. Have a lot of electronics scrap on-hand? Enhance it with copper wire and mini-LEDs by using paper circuit light-up card techniques. Materials science is always intriguing, and you can make quite a few cool textures using normal household ingredients. Pick your recipe based on what you have on-hand, or make a quick run to the grocery store to pick up the right bits for your favourite form of slime. Make stretchy slime using water, glue, and Borax for a material that will display decidedly non-Newtonian mechanics, or mix water into corn starch for something slimier. Not fond of the quasi-fluids? Create a silky, sticky powder by blending oil and flour for a distinctly textured alternative to sand, or add in water and cream of tarter to get buttery play dough for a more solid building material. Variations: Move beyond just kitchen ingredients by adding iron filings to the slime to make magnetic putty, or mixing sand and sugar for stratification experiments. Do you have more ideas for last-minute science gifts? Share them with us!